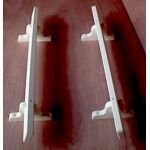 On-deck or on-dock small boat storage is typically handled by expensive, custom-made boat cradles or dinghy davits -- but Buck Woodcraft offers simple boat storage units made up of strong, durable rail chocks that easily adapt to a variety of small-boat hull forms: RIB dinghies, rowing skiffs, jet skis and other personal watercraft. 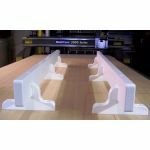 One of the nicest things about these rail chocks is that we fabricate them out of King Starboard--a marine-grade polymer that has a life expectancy that matches or exceeds fiberglass. Starboard never needs painting or refinishing, resists most stains, won't chip or corrode, and won't chip or scratch fiberglass hulls.